General Gnome and Garden Gnome Information - Just Say Gnome! You’re walking around a nice quiet neighborhood, it’s a beautiful Spring early evening and there’s many picturesque gardens along the street – when suddenly you notice a strange little figure with a bright red hat and bushy beard staring out at you through the bushes. What is it!? 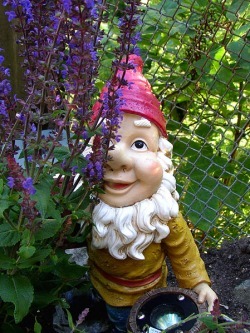 Modern garden gnomes are based on the legendary “Gnomes” of myth, mysticism, and fairy tales. 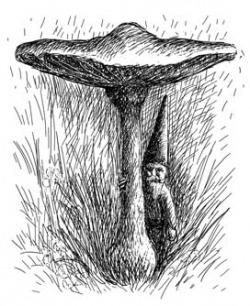 Gnomes have historically been described as small (from a few inches to a foot or two in height) stout beings who live in Nature - usually underground. European magicians and other mystics considered gnomes the most common and important elemental spirits of the ‘Earth’ element (the other three classical elements being: ‘Water,’ ‘Fire,’ and ‘Air’). Gnomes were said to wear conical hats and to be able to move through the earth itself as easily as we humans walk upon it, yet if any of these underground dwellers were caught out in the daylight it was said that the rays of the Sun turned them into stone. Sometimes gnomes were said to have magical powers to protect or punish people – or to reward them with happiness. Gnomes are also said to be guardians of secret underground treasures – especially gold! Even in modern times gnomes are said by some –such as the highly influential mystic Rudolph Steiner - to be involved in the hidden processes of plant life. In fact many farms, including prize-winning vineries, follow principles based on these beliefs. 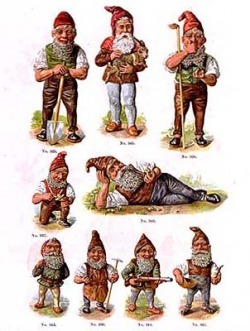 Gnomes are known by different names throughout different parts of Europe - for instance: they are called ‘barbegazi’ in Switzerland and France, ‘kaukis’ in Prussia, ‘leprechauns’ and ‘clurichauns’ in Ireland, ‘saunatonttu’ in Finland, ‘nisse’ or ‘tomte’ in Scandanavia, and ‘voettir’ in Iceland. Other parts of the world have traditions about very similar creatures. For example, in Japan magical beings such as ‘bakemono,’ ‘yokai,’ and even ‘tengu’ are comparable to gnomes. 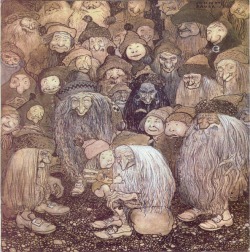 In fairy tales and other European mythologies gnomes are often confused with goblins, dwarves, and even elves. Today gnomes continue to feature in a wide variety of literature and other media - ranging from Harry Potter to South Park to even being used as the name of computer systems and aircraft engines. Garden gnome statues as we know them today were first created in the mid-1800s by Phillip Griebel, a sculptor of terracotta animals in the town of Graefenroda in Thuringia, Germany. Gnome legends were especially popular in Germany and Griebel made his gnome statues so that people could better enjoy the myths and stories of gnomes who tended to gardens at night. 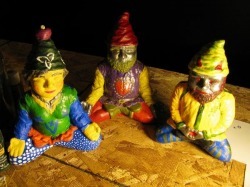 These first garden gnomes were molded from terracotta clay then dried, fired in a kiln, and finally painted. Garden Gnomes soon became very popular and several companies rose up to produce them. Gnome production in Germany dropped back sharply in World War II and today almost all manufacturers of garden gnome statues are located in China and Poland. But even today Phillip Griebel’s descendants continue to produce gnomes in Germany where they are the last manufacturer carrying on the tradition there. The popularity of garden gnomes began to spread across the world soon after their creation. In 1847, returning from his travels in Germany, Sir Charles Isham brought twenty-one terracotta gnomes back to his home in the United Kingdom. Only one of these twenty-one original gnome immigrants to England survives today. Known as “Lampy” this centenarian-plus gnome is still kept on display and is insured for one million pounds! 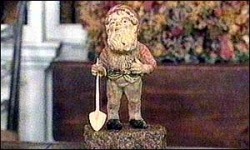 With their reputation expanding out from Germany, garden gnomes soon became popular across Europe and particularly in England and France, where gardening is looked upon as a very serious undertaking. Today of course Garden Gnomes have become a familiar sight around the world. 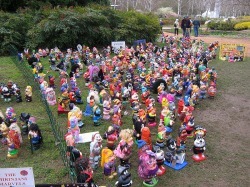 Apparently loosely modeled around animal rights movements such as the Animal Liberation Front (ALF), these individual and group efforts to “liberate” garden gnomes from their garden homes claim that gnomes are unjustly imprisoned and treated cruelly by their human “owners.” Though it is difficult to precisely determine their numbers and exact tactics, the largest and most organized of these liberation groups appear to be centered in Europe. Each of these organization has their own unique approach to how they achieve gnome “freedom.” The best known of these liberation groups, France’s Front de Libération des Nains de Jardin (FLNJ), releases gnomes into local forests – which the Front claims is natural gnome habitat. Much more close to home, in our own beloved state of Oregon there is a grassroots group centered only a little south in Corvallis which takes a somewhat more peaceful and communicative approach: instead of just abducting or crushing gnomes this group first leaves gnome owners a letter explaining how their gnomes are being treated cruelly and offering the owner a chance to hand their statuary friend over peacefully. Strangely the federal government has yet to label gnome liberators as ‘terrorists’ although it seems to consider animal liberation groups to be among the most dangerous of domestic activist organizations aggressively handing out lifetime sentences and million dollar fines to even minor offenders…?. GNOME CRIMINALS HERE IN OREGON!? Besides the direct action gnome liberation groups mentioned above, there are also legitimate political organizations working for gnome rights and freedom. Again, the largest of these organizations is in France: the Mouvement d´Émancipation des Nains de Jardin (MENJ), while ‘Free The Gnomes’ is the non-violent and legal branch of Italy’s infamous MALAG (Garden Gnome Liberation Front). The MENJ well represents almost all garden gnome liberation organizations with their view that gnomes have an inalienable right to freedom – just as do humans and that it is very ethically wrong to force gnomes to stand in gardens without pay and without their stated consent – regardless of whether the gnomes are put there merely to serve as ornamentation or for some other allegedly more meaningful purpose. 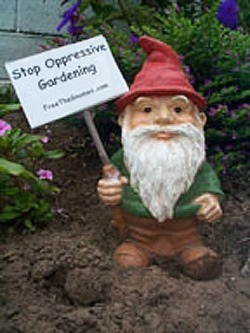 Beyond these direct action gnome liberation groups and their legal counterparts there are newly emerging sanctuaries for gnomes recovering from their time in enforced servitude – where they can live out the remainder of their lives in nature and in peace. The European Gnome Sanctuary in Barga, Italy has served as such a sanctuary since 1999. We here at Just Say Gnome! are proud of the fact that our gnomes are very well-informed about and comfortable with their future careers as garden residents. In fact they all eagerly anticipate making a personal contribution to whatever garden or house they may find themselves in. Whether it’s the Garden Om’s meditative vision of spreading peaceful vibrations through your yard and home, or Garden Gnome Chomsky’s patient and self-assured enthusiasm for raising the political awareness of your family and all visitors to your home, you can be well-assured that our gnomes are very happy – even blissful – with their lot in life! As our business grows we hope to donate a portion of our earnings to existing gnome sanctuaries or to even begin one of our own. Of course despite the good treatment of our gnomes we are still concerned that well-meaning gnome liberators might not realize this difference and may still try to abduct your Just Say Gnome! With this concern in mind we have been contemplating the development of special security enhanced gnomes with extra concrete and rebar rooting devices and possibly even electronic gnome surveillance security systems. 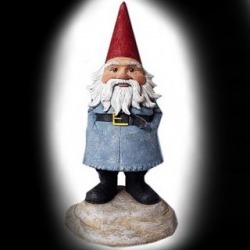 For the time being – whether you have lost gnomes recently or in the more distant past – you may find the international database “Gnomes Without Homes” useful as it provides a place to post photos and information about missing gnomes and sometimes gnome abductors use it to post travel photos of gnomes they are escorting around the world. update - the last time i checked this site it was closed until further notice.